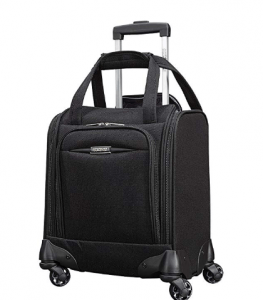 Black American Tourister Meridian NXT 16” is a soft shell bag- tote with a modern design, that can be used as your carry-on under-seater luggage as it is well below the airline restrictions for cabin bags. It will comfortably fit under most airline seats as well, and you can keep it close to you for items you may need during your trip. It scores 5 out of 5 stars by two customers, as it was released only very recently. And you can purchase it in black, red or royal blue which are priced the same on the day of this review. All three colors are quite nice but by picking the royal blue or the red you’ll make it easier for you to find your bag in a crowded airport luggage pick-up point.It is made of rough and sturdy polyester material that will offer great protection for your belongings. You have the locking handle with a push-button for locking the handle at two points. It has a fully lined interior with mesh pocket on the lid and the elastic cross straps on the other side as well as the exterior pockets. 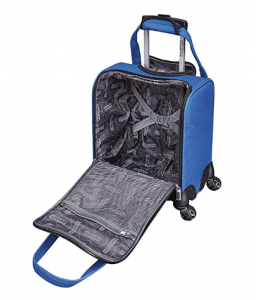 You have the 360-degree rotating multi-directional spinner wheel system with the four solid wheels for you to move the bag without much effort by holding its ergonomic telescoping handle. The shipping weight for this black American Tourister tote is 9.53 pounds and it has the measurements of 8.7 x 16 x 13.8 inches. And you can certainly use it as a carry-on luggage to take with you on the plane. Having said that it offers an ample space for your clothes and other items you may want to take on your overnight or weekend trips. Or this may make a nice addition to your large checked-in luggage on your long travels. It is certainly a very nicely made, good quality bag at a reasonable price if you’re on the market for something along the lines.